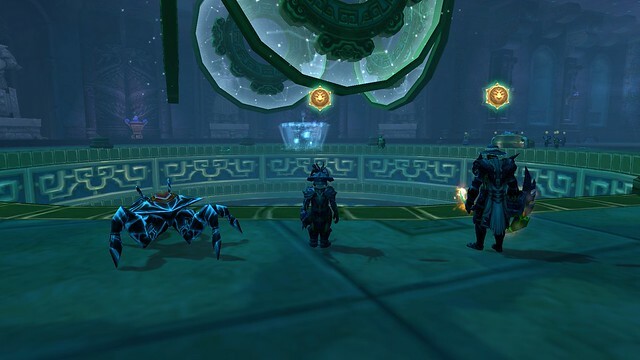 Today's Bug Report comes courtesy of Mogu'shan Vaults. This is the Elegon encounter. If you've never been here or done this raid, the boss, which is a sparkly dragon, shows up under those discs hanging from the ceiling. A clear floor shows up under him. During the encounter, you need to kill an add, kill some balls of light and then destroy pillars situated around the floor. The floor will despawn during the fight, too, so you have to be aware of any warnings you're getting. Spectacular Death has a policy of requiring a 50 gold donation to the guild bank if you don't get off the floor before it despawns. You do no healing, tanking or dps if you're somewhere at the bottom of the hole, so heed the warnings and get off. We discovered that if you kill the boss too fast, which can happen when your raid is made up of level 100s, you break the encounter. This raid's mobs are level 90. We kind of killed Elegon really fast and when his loot chest spawned in the center of the circle, the floor did not. The toon to my right, Minaithelan, tried a few different ways to get to the chest but it was for naught. What to do? Well, first of all, don't have everyone in your raid submit a ticket to notify the game masters that you've had an issue. We had over half the raid submit tickets and while that got us quick attention, the GM's were not happy. Designate someone, preferably your raid leader, to put in the ticket explaining what happened. Secondly, you can wait 30 minutes for what's called a "hard reset". Everyone needs to leave the raid instance and they can leave the raid. Go pick herbs or pick on horde or another boss. At the end of 30 minutes, have the same person who started the raid, invite everyone back in. Under their portrait's drop down menu, click "Reset all instances". Supposedly, this restarts the raid from the point you left off. You should be able to get to this chest and finish up the raid. We simply disbanded and came in two days later to finish the raid. The GM's sent me all the loot which I couldn't hand out to people so I sold it and stuck the proceeds into the guild bank. Elegon drops a mount which looks just like him so people are running this raid frequently for that mount. But, as we've discovered with the Mount Hyjal Burning Crusades raid, doing all of this is not a guarantee of getting the raid to work. As nice as it is to just blast through older content, you are probably going to have to go slower than you'd like just so you don't break it. 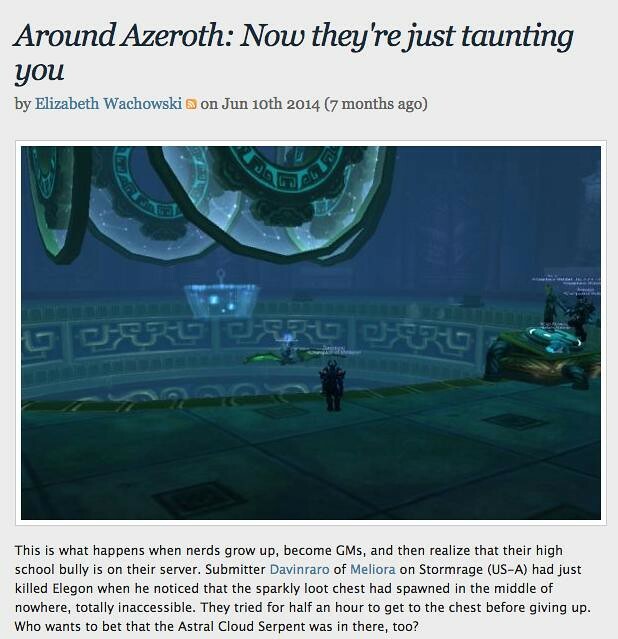 Ironically, while searching the former WOWInsider site for all the times Spectacular Death had been mentioned in their "Around Azeroth" column, I stumbled across this. Guess we're not the only ones to have a floor issue.